8/24/2018 The damn'd deed is done. What loving god could have allowed this monster to obtain such power? The world has become a less wonderful place. The damn'd deed is done. What loving god could have allowed this monster to obtain such power? The world has become a less wonderful place. To make things easier here is Pruvis's profile. 9/13/2018 I am now immortal. Hooray! Will probably not respond to any cider sip requests though, apologies. I'm just bragging. 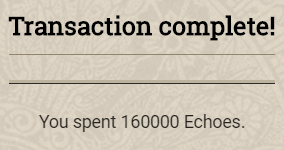 For I have misplaced my 160,000 echo purchase. Where can I find the damnable thing in my invetory? 9/13/2018 Two more members of our ranks! Congratulations! 10/12/2018 I have become cidered. I look forward to spreading sips to people. Maintaining a controlling interest in my soul requires a pretty constant negotiation between the various shareholder interests. Thankfully the Fingerkings 23% control makes a pretty good foil to unite the other factions enough to get to 51%. I have become cidered. I look forward to spreading sips to people. 11/9/2018 finally sold a ton of my stuff and got myself a nice cider. if anyone send me something nice and ask for a sip, I would be happy to share when I got actions to spare. I am open to social actions except affluent photographer and loitering. Correspondent and willing to make orphanage calls. 12/24/2018 I've also got a Firkin of Cider now. Yay! I've also got a Firkin of Cider now. Yay! Uhuuuu, big congratulations, mate, big congratulations! 1/21/2019 Hello hello! I've joined the club! Now to enjoy a taste or two before I head... oh... nowhere. 2/4/2019 And so shall she never die. 2/16/2019 I should really save up the echoes to get the cider XD But if someone wants to offer me a sip, I'll gladly take it! 2/17/2019 Jolanda Swan has quietly ascended to the ranks of the immortals, and is preparing her bags for a short surface trip now that she can finally feel the sun on her face again. It has been an exciting grind - now onwards to the Impossible Theorem! And flowers aloft, shading the fount of life. At long last, I hold it in my hands. I can walk beneath the Sun once more.